Nearson whip antennas are magnet mount antennas for installation on cars for public safety, ISM, LTE, telemetry, RFID, IoT, and railroad applications. 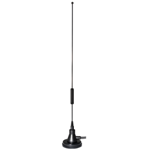 They operate on 800-900 MHz / 1.7 - 1.9 GHz frequencies and provide 2 to 4 dBi gain. 13 ft. cable is included.